In a downtown rife with restaurants, the new Old Fields immediately stands out. This is a dining room for everyone, whether you're coming for a burger or filet mignon, a pumpkin spice martini or a chocolate malted. Every day, Old Fields is full of good feeling and often excellent food. Open daily for dinner, from 5 p.m. Monday-Saturday, from 4 p.m. Sunday. Lunch on Saturday, brunch on Sunday. 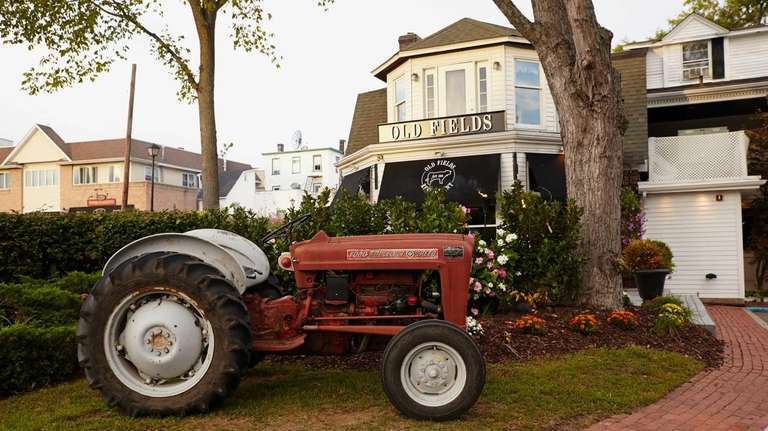 Old Fields is a Greenlawn landmark. It's about to become one in Port Jefferson. In a downtown rife with restaurants, the new Old Fields immediately stands out. This is a dining room for everyone, whether you're coming for a burger or filet mignon, a pumpkin spice martini or a chocolate malted. 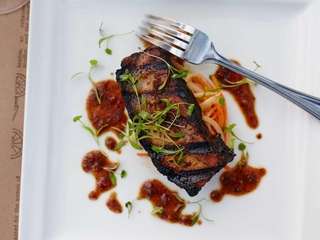 The gastropub opens in the space occupied for a decade by Pace's Steak House. Owner David Tunney runs a warm, welcoming, exposed-brick establishment that already feels like a neighborhood mainstay on weekdays and definitely is a noisy, festive destination on weekends. Every day, Old Fields is full of good feeling and often excellent food. Corporate chef David Rothstein oversees the two Old Fields; Erica Carries is the executive chef in Port Jefferson. Their fare starts with a generous serving of shrimp atop smoked-Cheddar grits and buttermilk-fried "popcorn" chicken ready for a honey-mustard dip. The obligatory chicken wings are plump and crunchy. Onion soup gratinée braces you for autumn. A peach-and-arugula salad, ample and tasty, is a refreshing summer farewell. Likewise, a salad of heirloom tomatoes. Anytime, try the rich, braised pork belly with chipotle-spiked corn pudding; or the lush macaroni and cheese, fueled with Taleggio, fontina and Parmesan. You're better off with blue cheese instead of Brie in baked crostini. The spinach-and-artichoke dip improves on standard bar food. The crabcake needs its boost from spicy aioli. Old Fields is a burger bastion. Focus on the Davey Gravey, a flavorful hamburger that arrives between two grilled-cheese sandwiches. If this glorious excess isn't sufficient, top the burger with a fried egg. You'll also be drawn to the savory ahi tuna sandwich, an inch-thick steak brushed with black-olive tapenade and basil aioli before it's crowned with pepperoncini. The house's filet mignon benefits from a mushroom demi-glace and sauteed onions. Elemental alternatives: the bone-in rib eye and the marinated flat iron. "Dave's roasted chicken" arrives juicy and satisfying. So does the duck two ways, starring a seared breast and confit of leg, with a rhubarb-pomegranate reduction. On Sundays, fried chicken is served. Roasted vegetable ravioli with tomato confit is a bit bland. There's a fish dish of the day. If you're lucky, it will be the Provençal-inspired seafood stew, with a hint of anise and precisely cooked shellfish and finfish. A little ice cream soda materializes after the plates are cleared, maybe to cleanse your palate. One sip will make you order a large one for dessert. A scoop of vanilla ice cream enriches the outstanding bread pudding, which could feed a group. The pudding alone merits landmark status, too.